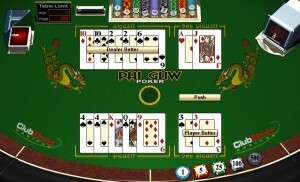 Pai Gow is a popular old Chinese dominoes game, and Pai Gow poker is the Westernized fusion of Pai Gow and poker. Pai Gow poker may have foreign influences, but its use of the standard card deck makes it seem familiar too. The game has only been around for 30 or so years, but online Pai Gow poker gives everyone a chance to enjoy this fun new poker variant. There is a certain element of ceremony in live Pai Gow poker, especially when it comes to establishing the betting positions. The banker position rotates in the live version of the game, so the order of betting and dealing also rotates. In online Pai Gow poker, things are a little more straightforward, especially if you are playing solo. If you are playing in a group, then once all of the players have made their bets a starting position will be randomly determined and the dealing will commence there and proceed counter-clockwise around the table. Though some live games allow players to deal, online dealing is automated, and the dealer position is represented by the house. To start, seven face down hands will be dealt with seven cards each. The remaining four cards will be placed in a discard pile. If there are more hands than players, then players have the option of taking a second hand, known as a “dragon hand.” Any hands that aren’t matched with a player will be placed in the discard pile. To prevent players from crippling their High Hand, it’s not allowed to have a Low Hand that is more valuable, so a pair will only appear in the Low Hand if a player is already using one in their High Hand. Though Pai Gow poker is fittingly named, it also has a little in common with another card game: blackjack. As with blackjack, Pai Gow poker players compete against the dealer’s hands instead of each others’. In order to receive a payout, players must beat both of the dealer’s hands. When a player only wins one hand, their original wager is a push. If the player and the dealer tie on hand values, then the dealer automatically wins. Having the cards face down until the hands are revealed eliminates a lot of the skill element used in blackjack, though. For this reason, players that also have a dragon hand don’t generally get to see it until the end of a round; instead, it is set by the dealer using house rules. The dealer’s hand is also set using house rules, and therein lies the opportunity for strategy.